Vitor Belfort and Luke Rockhold headline Saturday’s UFC on FX 8 fight card, so what better way to promote their shootout than by airing a feature on …. UFC middleweight king Anderson Silva (pictured)? 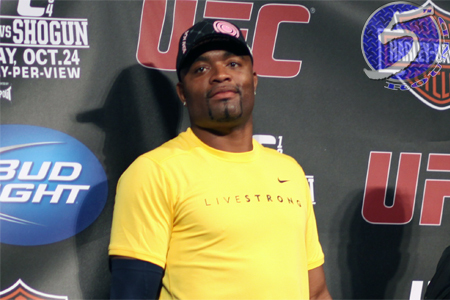 “UFC From All Angles: Anderson Silva” premieres tonight on FUEL TV at 9:30PM ET. The show is filmed at Silva’s new Muay Thai College in Torrance, California. “The Spider” talks about some of the key points in his illustrious career, including his first fight for the UFC title against then-champ Rich Franklin. Silva then opens up about the difficulties he’s faced in becoming the UFC’s most decorated champion. Silva also explains that there might be a higher calling for him than just fighting.